The bronze portrait of Tiberius from Herculaneum has many tales to tell. 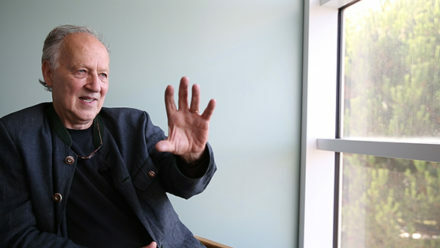 One that he’s hidden up until now is the story of how he got back on his feet. 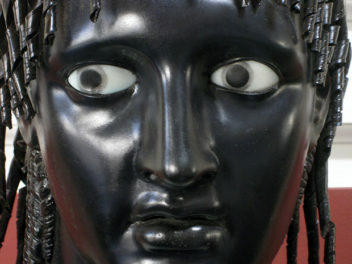 As we’ve described, the eight-foot-high statue had previously been off display in Naples for around two decades, and the primary purpose of his time here in Los Angeles was to get him ready to go back on public view. How did we manage this with over 1,000 pounds of ancient and 18th-century metal, in a way that is scarcely visible? In the video below, conservator Erik Risser provides an inside view (quite literally). 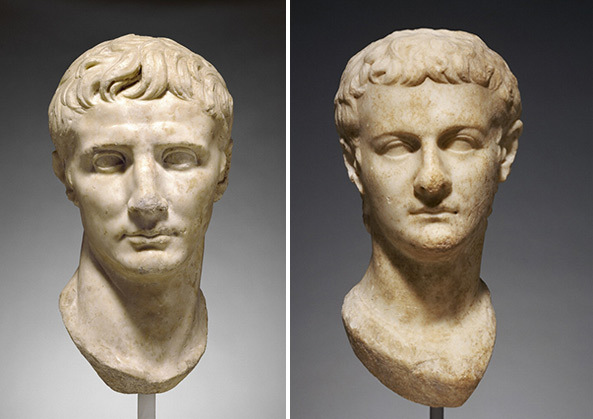 For the last six months, the portrait was the focus of a special exhibition, Tiberius, Portrait of an Emperor. Happily, our colleagues at the Museo Nazionale Archeologico in Naples generously extended the loan until September 2014, so you’ll be able to celebrate the 2000th anniversary of Tiberius’s accession by paying homage to him in our Men’s Gallery at the Getty Villa. 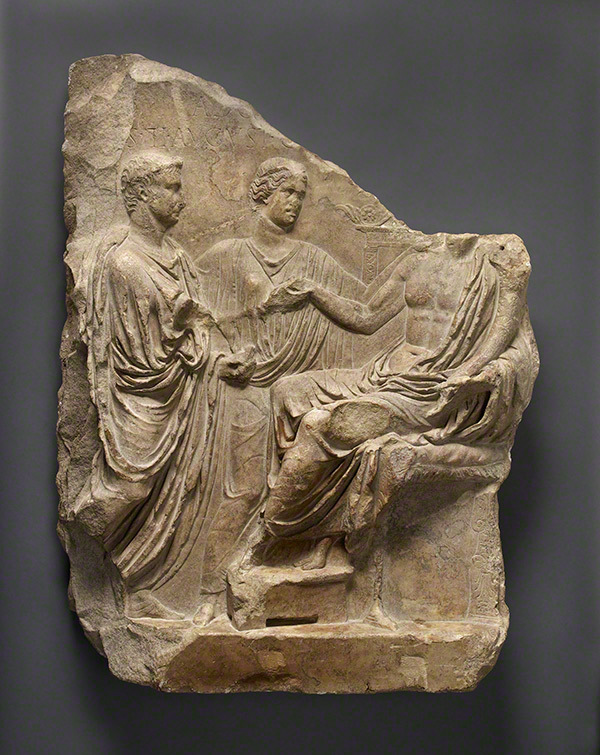 You’ll see the portrait alongside an unusual relief that’s also on loan to the Museum, in which Tiberius has been identified as taking the hand of a cornucopia-bearing Genius overseen by Concordia (Harmony). Elsewhere in this gallery, there are portraits of other Roman emperors, notably Tiberius’s predecessor, Augustus and his successor, Caligula. Which begs the question: when the Villa closes for the day, what might Rome’s rulers say to one another? Emperor, meet emperor: Augustus (Tiberius’s adoptive father) and Caligula (Tiberius’s adopted grandson). Left: Head of Emperor Augustus, 25–1 B.C., Roman. Marble, 15 3/8 in. high. 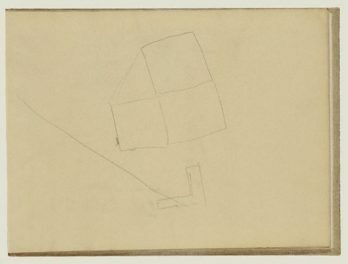 The J. Paul Getty Museum, 78.AA.261. Right: Head of Emperor Caligula, about A.D. 40, Roman, made in Asia Minor. Marble, 16 15/16 in. high. The J. Paul Getty Museum, 72.AA.155. Actually, there’d probably just be an awkward silence. Back in 38 B.C., Augustus (then known as Octavian) had taken up with Livia, and taken her son, the three-year-old Tiberius, away from his father’s house. Twenty-six years later, Augustus meddled further in his stepson’s affairs, this time compelling him to divorce his beloved wife Vipsania and marry Julia instead, all because Augustus wanted to secure the succession. 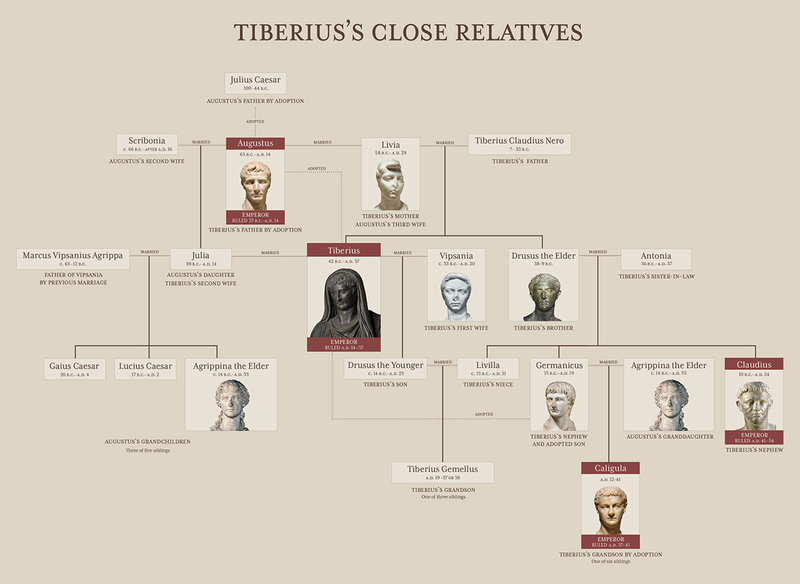 Even then, Tiberius wasn’t the first choice to follow as ruler, and it was only in A.D. 4—when Tiberius was 44—that he was formally adopted by Augustus. Hardly a ringing endorsement, and Augustus reportedly said of him, “poor Rome, doomed to be ground by those slow-moving jaws.” Some even claimed that Augustus had opted to appoint Tiberius as emperor to look good by comparison. Tiberius’s family tree. He was the adopted son of one emperor (Augustus), the uncle of a second (Claudius), and the adoptive grandfather of a third (Caligula). See this chart larger. Might Tiberius have more to say to Caligula? Hardly. Tacitus reports that while Caligula was living alongside Tiberius on the island of Capri, the young man would take note of his mood and act in a similar fashion. Yet the old emperor seems to have seen through the Caligula’s duplicitous and obsequious behavior. “I am nursing a viper in Rome’s bosom,” he once said, and this would prove remarkably prescient. 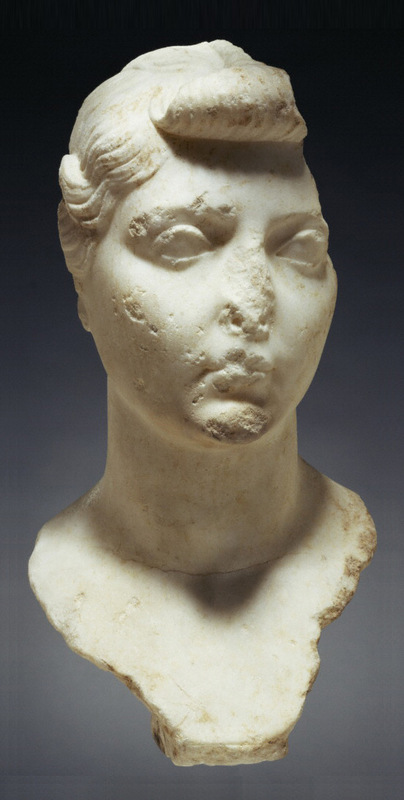 And Tiberius’s mother, Livia, whom you can find in our Women’s Gallery? Suetonius tells us that in the last three years of her life, Tiberius visited her only once. When she died, he didn’t attend her funeral. He vetoed her deification too. And annulled her will. So it’s probably best that they’re in separate galleries; even after all this time, they still might not be on speaking terms. 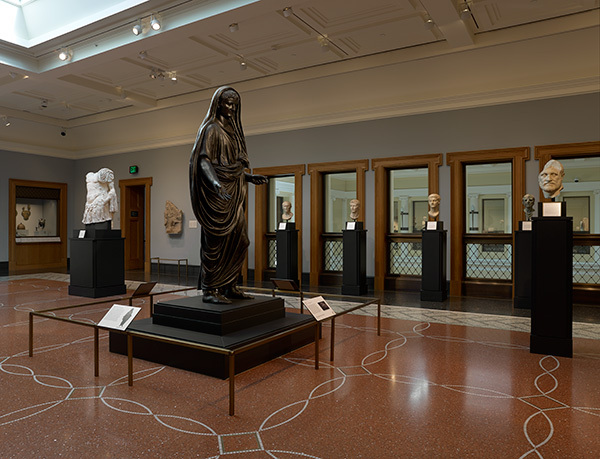 What a treat that the Getty Villa keeps showing and displaying these wonderful works of Julio Clauidan art with the Tiberian Concordia relief and this wonderfully restored Bronze oversize statue of princeps Tiberius!! I hope everyone can see it, I am taking a trip down from Nor Cal. My Latin students and I LOVE (valde amamus) the family tree with the portrait images. Could you please a better resolution image so I can project this in class? Thank you so much for this – I’m really happy to read that the family tree that we assembled for the exhibition is proving fruitful in the classroom. A number of the images are of objects in other collections, and we don’t have the rights to reproduce those in higher resolution online, I’m afraid. But clicking on the graphic does increase the size, if that helps. Why Is This Drawing in a Museum?